While it’s handy to use voice commands to make phone calls or change the radio station in your car — instead of taking your hands off the wheel to do so — according to a new study, infotainment systems still provide a distraction for drivers. It takes drivers up to 27 seconds to return to full attention after they’ve commanded their cars to do something, according to a study from the AAA Foundation for Traffic Safety released Thursday. In that time, drivers going 25 miles per hour would travel the length of three football fields. The study was one of two conducted by the University of Utah for AAA, and compared different voice-operated systems among 2015 model-year vehicles. 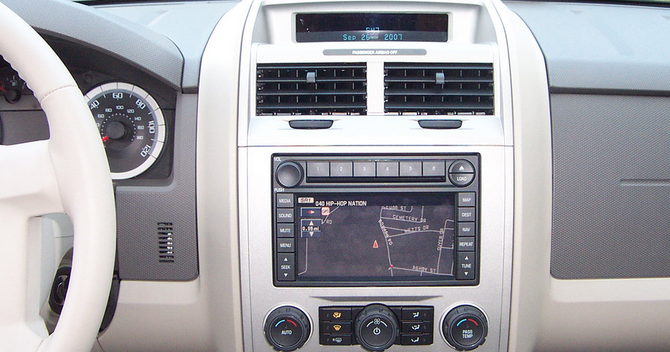 The least distracting infotainment systems were found to be in the Chevrolet Equinox, Buick Lacrosse and Toyota 4Runner. That’s because they’re more intuitive and better at actually deciphering what you’re saying, the authors said. Because we all know how fun it is to keep yelling at your car when it insists on telling you where to find a bigger door when all you want is the nearest liquor store. On the other end, systems in the Ford Taurus, Chevrolet Malibu, Volkswagen Passat, Nissan Altima, Chrysler 200 and Hyundai Sonata didn’t do as well in the study. The most distracting system belongs to the Mazda6, according to the study: researchers found that there were multiple steps involved in actions, the system wasn’t great at translating human and it took longer to complete tasks. For example, just to switch radio stations, users would have to first say “frequency” and the station number they wanted. The study was based on 257 research subjects who had the cars at home for five days. Practice didn’t make perfect, however: tasks that were hard on Day 1 were still tricky on the last day, researchers said. In another study, researchers looked at the level of distraction when drivers use mobile phones with voice commands. Google Now was more intuitive and thus, slightly less distracting, then Apple’s Siri and Microsoft’s Cortana, according to researchers. One of the study’s authors says voice command systems are usually rigid, and require drivers to know very specific commands to do a plethora of tasks. Even if you get that command right, that doesn’t mean the system will actually understand you. And what happens when something isn’t working while you’re driving? You wonder why it isn’t working, and try to fix it, which is a distraction. AAA says it’s going to share its findings with lawmakers and government agencies. This isn’t the first time studies have found voice command systems used in cars to be a distraction: two October 2014 studies found that onboard systems that talk with their drivers and services like Siri could cause trouble behind the wheel, due to how clunky they can be to use.